Jesus (Ιησούς) in Amaraic was Yeshua ישוע.The word Christ did not exist in Aramaic.It comes from the Greek word Χριστός which means 'the anointed one' and is a translation of the Aramaic Msheekha מְשִׁיחָא (Messiah).So Jesus Christ is Yeshua Msheekha in Aramaic. 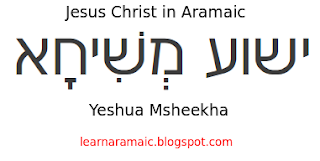 So Jesus Christ in Aramaic is Yeshua Msheekha .In Syriac there are of course variants ,Yeshuo Msheekho in Western Syriac,Yeshua Msheekha in Eastern Syriac.You may also see Eeshoo instead of Yeshua. The following video shows you how to write Jesus in the Estrangelo script. Yeshua written in the Herodian script.